Reduces rates of deep venous thrombosis (DVT): Epidural and spinal anesthesia both reduce DVT risk by improving blood flow through the legs secondary to sympathectomy-induced vasodilatation; both anesthesia methods may also reduce perioperative hypercoagulability that occurs as a result of the surgical stress response. A caveat is that many of the studies that showed decreased risk of DVT were from an era when routine thromboprophylaxis was not used. Allows patient involvement: Some patients enjoy the ability to watch knee arthroscopic procedures on the video monitor. Improves pain control: Regional techniques can block or reduce pain anywhere from several hours to several days, depending on the technique used. Preemptive pain management may reduce subsequent pain in the days to weeks following surgery. Greater pain control has the potential to allow for earlier hospital discharge and may improve the patient's ability to tolerate physical therapy. Various regional analgesia techniques exist that can be used to promote postoperative pain relief. These methods can be categorized into neuraxial local analgesics and narcotics, peripheral nerve blocks, and wound infiltration. Intrathecal (IT) narcotics can offer effective postoperative analgesia. These agents bind with opioid receptor sites in the dorsal horn of the spinal cord, resulting in modulation of pain signals at the spinal cord level. 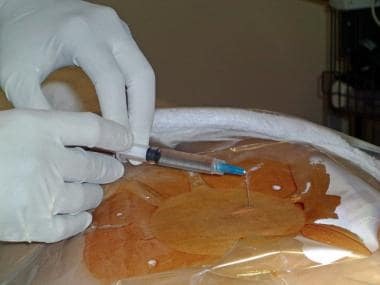 IT narcotics can be administered as an adjunct to general anesthesia (eg, for scoliosis surgery), or they can be mixed with local anesthetics and administered during spinal anesthesia (eg, for total hip arthroplasty). For IT morphine, the onset of analgesia is 30-60 minutes, and the duration of analgesia is 18-24 hours, depending on the dose that is used. Contraindications to use of IT anesthesia include heparinization or other coagulopathy, local or systemic infection, and morphine allergy. However, when used in knee and hip arthroplasty, the author limits the dose to 150 mcg. This is because now typically multimodal analgesics (celecoxib, acetaminophen, gabapentin) and peripheral nerve blocks are used in conjunction with IT morphine. Using a lower dose results in lower incidence of nausea, itching, and respiratory depression. Epidural analgesia is accomplished by means of epidural narcotics, local anesthetics, or their combination. Narcotics can be administered by bolus or infusion. Adverse effects are the same as those of IT narcotics (see Intrathecal analgesia, above). Epidural local anesthetics, typically diluted solutions of bupivacaine or ropivacaine, are administered by infusion. Adverse effects of epidural local anesthetics include urinary retention, motor block, and a sympathectomy-induced decrease in blood pressure. Epidural local anesthetics and narcotics are frequently combined in lower dosages to decrease the risk of each drug's associated adverse effects. The duration of epidural infusion depends on several factors. Epidural catheters must be removed before the advent of significant anticoagulation from heparin, low-molecular-weight heparins (LMWHs), or warfarin (Coumadin; Bristol-Myers Squibb Co, Princeton, NJ). The authors generally remove epidural catheters by 72 hours to reduce the risk bacterial colonization at the catheter site. A wide variety of dosing regimens for regional anesthesia are in use. Narcotic and local anesthetic drugs can be combined in the same infusion and run at a lower rate. Intravenous (IV) PCA narcotics can be administered as an adjunct to local anesthetic infusions. The American Society of Regional Anesthesia and Pain Medicine (ASRA) has made recommendations regarding the safe conduct of neuraxial blocks when patients are on anticoagulants before or after surgery. Three editions have been published, and work is underway on a fourth edition. When any anticoagulant is administered perioperatively in a patient with a neuraxial catheter in place, close neurologic monitoring of the lower extremities is mandated. Some common scenarios follow. Intraoperative IV heparinization: Delay heparin for 1 hour after needle insertion. The 3rd Edition ASRA Guidelines did not include recomendations for many of the newer anticoagulant drugs that have since come to market. While work continues on the full 4th Edition, ASRA has posted draft recommended time intervals before and after neuraxial block or catheter removal for some of these drugs here. Peripheral nerve blocks can provide significant pain relief. Nerve blocks can either be combined with general anesthesia or used as the sole anesthetic. Long-acting local anesthetics, such as bupivacaine or ropivacaine, provide nerve-block duration of approximately 12-18 hours. Certain additives may prolong this duration; for example, the addition of dexamethasone or methylprednisolone may provide an additional 6-10 hours of analgesia. [12, 13] However, longer duration can best be reliably achieved by the perineural placement of catheters, which are then infused continuously, or bolused as needed. Serious adverse effects of peripheral nerve blocks are rare. Adverse effects can be categorized as due to either local anesthetic toxicity, complications of needle placement, or spillover of local anesthetic to the surrounding neural structures. Local anesthetic toxicity can occur because of unplanned intravascular injection or slow absorption from the injection site. This can manifest as reactions ranging from tinnitus and dizziness to convulsions and cardiac arrest. Complications of needle placement can include hematomas, dysesthesias (0.2%),  and other problems related to the specific nerve block. Spillover adverse effects are manifested mainly in interscalene and supraclavicular blocks. Peripheral nerve blocks have the advantages of no sympathectomy-induced decrease in blood pressure and no narcotic-related adverse effects such as urinary retention, nausea, or itching. However, some degree of motor block is observed with the sensory block. This result may limit the usefulness of some peripheral blocks in certain situations. For example, prolonged femoral blocks are a good choice for pain control in anterior cruciate ligament (ACL) reconstructions, but they are not a good choice in knee arthroscopy because the quadriceps motor block would prevent safe ambulation. Successful use of nerve blocks depends not only on clinical knowledge of the site of incision innervation but also on knowledge of the innervation for the underlying bone and muscular tissue. The brachial plexus can be anesthetized at sites above the clavicle (interscalene and supraclavicular approaches) or below the clavicle (infraclavicular and axillary approaches). The interscalene approach is used for shoulder and upper arm surgery because the roots of both the brachial and cervical plexuses are anesthetized. This is generally not a good approach for lower arm or hand surgery because the C8 and T1 nerve roots are frequently inadequately anesthetized. The supraclavicular approach can result in good block of the arm and hand. The infraclavicular or axillary approaches are used for surgery of the elbow, lower arm, and hand. Interscalene and supraclavicular blocks, although safely performed in most patients, have more adverse effects and risks associated with them. Phrenic nerve dysfunction occurs in 100% of interscalene blocks  and 25-50% of supraclavicular blocks. Thus, these blocks may not be well tolerated in patients with preexisting respiratory compromise. Research suggests that pulmonary function can be preserved by using lower-volume, lower-concentration, and lower-level (C7) ultrasound-guided approaches. [17, 18] Case reports describe epidural  or IT injections  with interscalene blocks. Pneumothorax has been reported to occur in up to 5% of supraclavicular blocks, but the incidence is probably now much less than 1% with the advent of ultrasound-guided techniques. Horner syndrome and hoarseness commonly occur from spread of anesthetic to the sympathetic chain and recurrent laryngeal nerve, respectively. 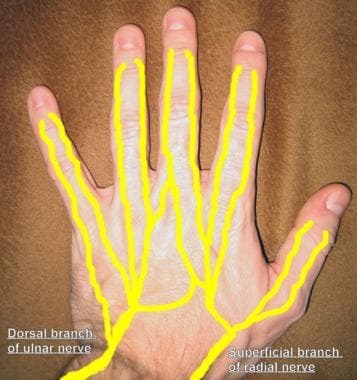 For hand surgeries, more distal blocks can also be performed to provide analgesia. 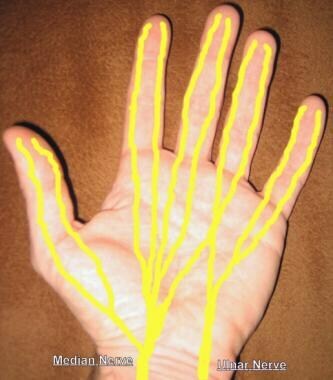 Block of the radial, median, and ulnar nerves at the wrist or block of the digital nerves of the fingers (see the images below) can be performed. The knee joint is innervated by the femoral (anteriorly), sciatic (posteriorly), obturator (medially), and lateral femoral cutaneous nerves (laterally). Femoral nerve blocks are frequently used for analgesia after knee surgery; however, the degree of analgesia depends on the amount of surgical trespass into other nerve distributions. Thus, patients undergoing arthroscopic ACL and patellar surgery obtain excellent pain relief after femoral block, whereas patients undergoing knee replacement surgery frequently have severe posterior pain of sciatic origin. Unless the knee is properly braced, weightbearing and ambulation may need to be restricted until quadriceps function recovers in patients with femoral nerve blocks. Sciatic nerve or popliteal fossa blocks are performed to provide analgesia after foot surgery. The popliteal fossa block is a block of the sciatic nerve in the popliteal fossa in the vicinity of the sciatic nerve's division into the tibial and common peroneal nerves. The advantage of a popliteal fossa block over standard sciatic blocks is that hamstring function is maintained. A saphenous block can be added if the site of surgery includes the medial malleolus. For some foot or toe surgeries, more distal nerve blocks can also be performed to provide analgesia. Blocks of the deep peroneal, superficial peroneal, tibial, sural, and saphenous nerves can be performed at the ankle level, or block of the digital nerves of the toes can be used. The infiltration of wounds with local anesthetics not only provides analgesia but also appears to reduce the local inflammatory response to trauma or surgery. Thus, local infiltration may help reduce the upregulation of peripheral nociceptors that manifests as hypersensitivity to a stimulus. Local anesthetics have been administered incisionally, intraarticularly, and as higher volume infiltration of the wound. Local anesthetic can be administered in skin incision sites or on bone wounds (iliac crest graft sites). Bupivacaine or ropivacaine provides approximately 6 hours of analgesia. Incisional catheters and local anesthetic infusions have been reported for use in general, thoracic, and cardiac surgeries, but appear to be less frequently reported in orthopedic surgery. In 2011, the FDA approved bupivacaine liposome injectable suspension (Exparel) for use in surgical pain. It is in effect a slow-release form of bupivacaine, which can provide analgesia for up to 72 hours. One of the early studies of its use was in bunionectomy patients, in whom improved analgesia and decreased narcotic need was shown. Data on the safety and efficacy of its use in traditional nerve blocks and for wound infiltration in other types of orthopedic surgery are not yet available. Skin infiltration with local anesthetic. The potential toxicity appears to depend on the concentration of local anesthetic, duration of exposure, and possibly other factors such as pH and the presence of other additives. Home-going intraarticular infusions can no longer be considered a safe practice. The risk of significant cartilage toxicity from single injections of low-dose local anesthetics is thought to be low. Peripherally located opioid receptors have been discovered in animals. Animal studies suggest that intraarticular inflammation induces the development of synovial opioid binding sites. In addition, intraarticular opioid administration appears to have an anti-inflammatory effect. Based on these observations, intraarticular narcotics are administered in knee and shoulder surgery. The effect of intraarticular morphine in knee arthroscopy has been examined in multiple studies. A meta-analysis concluded that a mild analgesic effect of intraarticular morphine is observed, but a systemic effect cannot be excluded completely. Whether a dose-response effect is observed and what the optimal dose is are still in question. Morphine doses of 1-5 mg have been used. In 2008, Kerr and Kohan described their technique of systematic infiltration of a mixture of ropivacaine, ketorolac, and epinephrine into the tissues around the surgical field in total knee and hip arthroplasty, and named it "local infiltration analgesia" (LIA). They described low pain scores, low narcotic requirements, early immobilization, and earlier hospital discharge. This was a nonrandomized uncontrolled case series. Since that first report, multiple other studies have examined the effectiveness of this technique or variations thereof. In 2011, Kehlet and Andersen published a review of this topic. They thought that many studies had design problems by not being placebo-controlled or with comparable systemic analgesia provided in the investigated groups. They concluded that little evidence supports the use of the technique in hip replacement, provided multimodal, oral nonopioid analgesia is given. However, they did believe this technique has a place in knee replacement surgery. It may be that this technique is best used to complement traditional regional anesthetic techniques. For example, in 2012, Mahadevan et al compared femoral and sciatic nerve blocks versus femoral and periarticular infiltration with levobupivacaine for total knee arthroplasty. No significant difference was noted between the groups in pain scores, morphine consumption, or range of motion. Thus, by avoiding sciatic nerve block, more motor function of the leg is preserved in the early postoperative period. For any specific surgery type, several regional anesthetic pain management options may be present. The choices may include the above-mentioned wound infiltration, neuraxial or peripheral nerve block techniques, or a combination of techniques. Analgesic techniques are selected based on the surgical trauma, goals for physical therapy, expected length of patients' hospital stay, and avoidance of adverse effects. IT morphine has been used as an adjunct in complex spine surgery such as scoliosis surgery. Iliac crest harvest site infiltration with morphine and local anesthetic is an option. Shoulder surgery can be performed under interscalene nerve block or a combination of general and interscalene block. Complete pain relief can be achieved (for the duration of the block) unless the incision extends close to the axilla or there are posterior arthroscopy portals out of the block territory. Other pain management options include subacromial or intra-articular morphine and local anesthetic. Interscalene, axillary, and infraclavicular catheters can be placed for prolonged pain relief or arm surgery. Besides pain relief, the arm sympathectomy may be of value in certain operations involving vascular repairs. Epidural local anesthetic and narcotic can be infused. The duration of the infusion is limited by perioperative anticoagulation for DVT prophylaxis and by the need to terminate motor nerve block so that physical therapy can be performed. Lumbar plexus blocks and catheters are used in some institutions to provide postoperative analgesia. Marino et al compared continuous lumbar plexus block with patient-controlled analgesia, continuous femoral block with patient-controlled analgesia, and patient-controlled analgesia alone in 225 patients who underwent unilateral total hip arthroplasty for osteoarthritis. Compared with continuous femoral nerve block and patient-controlled analgesia alone, continuous lumbar plexus block significantly reduced pain scores during physiotherapy on postoperative day 1 and day 2 and was associated with fewer opioid-related adverse effects, greater distances walked, and enhanced patient satisfaction. Additionally, both regional anesthesia techniques provided significantly greater reductions in total hydromorphone consumption and delirium than patient-controlled analgesia alone. As with hip surgery, epidural local anesthetic and narcotic can be infused, but the infusion duration is limited by perioperative anticoagulation for DVT prophylaxis. Other issues include potential for sympathectomy and bilateral leg motor weakness, both of which have potential to interfere with the performance of physical therapy. With femoral nerve blocks, patients typically have improved range of motion, but quadriceps weakness can increase the risk of falling. Sharma et al determined the complication rate associated with preoperative femoral nerve block for total knee arthroplasty. In 1018 total knee arthroplasties, 709 femoral nerve blocks were used by single-injection technique. Twelve patients treated with femoral nerve block sustained falls, 3 of whom required reoperation. The authors recommended that postoperative protocols be modified for patients who have femoral nerve block, because of decreased quadriceps function in the early postoperative period. Preliminary reports describe that performing femoral block more distally (in the adductor canal) may have a motor-sparing effect and still provide good analgesia. [40, 41] Because early ambulation and early physical therapy have become an increasing focus after joint replacement surgery, many centers have switched from traditional femoral blocks to using adductor canal blocks for analgesia after knee arthroplasty. Approximately 80% of patients with femoral nerve blocks have posterior knee pain that is of sciatic origin. There are multiple strategies to deal with this, each with pros and cons, such as (1) sciatic nerve single injection or catheter, (2) surgeon-performed local anesthetic injections, (3) transcapsular injection. A sciatic catheter provides the longest and most effective posterior pain relief. The downsides include an extra catheter and pump for the patient to deal with, potential for motor block and decreased ability to participate in physical therapy, and increased falls risk. In addition, a preoperative block reduces the ability to make an early diagnosis of any surgery-related peroneal nerve injury. Sciatic nerve block does not appear to allow earlier hospital discharge or change any functional outcomes. [42, 43] Sinha recently compared selective tibial nerve block to sciatic nerve block performed at the popliteal fossa. The tibial nerve block group had similar (and excellent) analgesia, but without complete peroneal motor block. Multiple variations in technique are described, including posterior capsular injections,  transcruciate injections into the space behind the joint capsule,  and intra-articular catheters. These techniques have the advantage of being easy to perform and, in general, have no associated motor block. The duration of analgesia is probably limited to the day of surgery. A transcapsular injection, which is a modification of the previously mentioned transcruciate injection technique, can also be used. It is performed by the surgeon after preparation of the distal femoral and proximal tibia at the time of either posterior cruciate retaining or substituting total knee replacement. With the knee flexed to 90°, the landmarks in the area of the intracondylar notch are identified. Flexing the knee and avoidance of any external compression in the area of the popliteal fossa allows the neurovascular structures in the area to fall away from the site of injection. An 18-gauge Tuohy needle is inserted in the anterior-medial corner of the intracondylar notch and carefully directed cephalad in line with the posterior cortex of the distal femur. Insertion of the needle in this position, rather than directly through the substance of the posterior cruciate ligament, increases the distance between the injection site and the popliteal neurovascular structures and reduces the risk of intravascular injection. A distinctive loss of resistance is typically noted as the needle penetrates the posterior capsule of the knee if the capsule has been undisturbed during the surgery. After the capsule is penetrated with the Tuohy needle, the site is aspirated to verify that the needle is not intravascular and the area injected with 20 mL of 0.25% Marcaine without epinephrine. If any resistance is encountered during the injection, the needle can be advanced slightly, reaspirated, and the injection completed. This transcapsular injection appears to block the terminal articular fibers of the posterior joint, without any of the typical sensory and motor block seen when the sciatic nerve is anesthetized. Use multimodal analgesics, which includes perioperative acetaminophen and ketorolac. Intraoperative transcapsular injections and wound infiltration by the surgeon. Postoperative parenteral or oral narcotics as needed. On rare occasions, a postoperative sciatic block is performed to deal with significant posterior pain. Femoral block can provide excellent analgesia for anterior cruciate ligament repairs with patella tendon grafts. For more prolonged analgesia, femoral nerve catheters can be placed and infused at home via disposable pump. If a quadriceps tendon graft is used, there may be significant posterior pain that is amenable to sciatic nerve block. For patient pain control in arthroscopy/meniscectomy, intraarticular local anesthetic and morphine are used routinely. Long-acting femoral blocks are avoided so that patient ambulation is not impeded. Foot and ankle pain can be controlled with a popliteal fossa block. The saphenous nerve may also need to be blocked if the surgical incision is on the medial aspect of the foot or ankle. It is a good strategy for the patient to receive a dose of narcotic before the expected time of nerve-block resolution. The authors typically have patient narcotic IV PCA pumps already set up and in use before the removal of epidural catheters. OxyContin (oxycodone HCl controlled-release tablets; Purdue Pharma LP, Stamford, Conn) has been used as an effective analgesic for orthopedic procedures. For example, the first dose of OxyContin can be administered 10-12 hours after the placement of a bupivacaine interscalene nerve block for shoulder surgery. As-needed narcotics should always be available for pain control once the nerve block has terminated. As mentioned, NSAIDs can be used as a supplement to narcotics. Intravenous ketorolac (Toradol; Roche Laboratories Inc, Nutley, NJ) 15-30 mg IV every 6 hours is a very effective pain reliever of orthopedic pain, and without respiratory depressant effects. As an NSAID, it does have antiplatelet effects and has the potential to increase wound drainage, especially in patients who are receiving postoperative thromboembolic prophylaxis. Another alternative is the oral cyclooxygenase-2 (COX-2)–inhibitor drug celecoxib (Celebrex; Pfizer Inc, New York, NY). Celecoxib can be administered preoperatively as a 200-400 mg load, then continued with a dose of 200 mg orally once a day. The advantage of this drug is that it does not cause significant platelet dysfunction, so it is less likely to contribute to excessive wound drainage. However, there is controversy regarding the use of celecoxib in patients with known cardiac disease or with risk factors for cardiac disease. Mauermann WJ, Shilling AM, Zuo Z. A comparison of neuraxial block versus general anesthesia for elective total hip replacement: a meta-analysis. Anesth Analg. 2006 Oct. 103(4):1018-25. [Medline]. Halaszynski TM. Pain management in the elderly and cognitively impaired patient: the role of regional anesthesia and analgesia. Curr Opin Anaesthesiol. 2009 Oct. 22(5):594-9. [Medline]. Rawal N, Arnér S, Gustafsson LL, Allvin R. Present state of extradural and intrathecal opioid analgesia in Sweden. A nationwide follow-up survey. Br J Anaesth. 1987 Jun. 59(6):791-9. [Medline]. Gwirtz K. Single-dose intrathecal opioids in the management of acute postoperative pain. Sinatra RS, Hord AH, Ginsberg B, Preble LM, eds. Acute Pain: Mechanisms & Management. St Louis, Mo: Mosby-Year Book; 1992. 253-68. Horlocker TT, Burton AW, Connis RT, Hughes SC, Nickinovich DG, et al. Practice guidelines for the prevention, detection, and management of respiratory depression associated with neuraxial opioid administration. Anesthesiology. 2009 Feb. 110(2):218-30. [Medline]. Viscusi ER, Martin G, Hartrick CT, Singla N, Manvelian G,. Forty-eight hours of postoperative pain relief after total hip arthroplasty with a novel, extended-release epidural morphine formulation. Anesthesiology. 2005 May. 102(5):1014-22. [Medline]. Hartrick CT, Martin G, Kantor G, Koncelik J, Manvelian G. Evaluation of a single-dose, extended-release epidural morphine formulation for pain after knee arthroplasty. J Bone Joint Surg Am. 2006 Feb. 88(2):273-81. [Medline]. Horlocker TT, Wedel DJ, Rowlingson JC, Enneking FK, Kopp SL, Benzon HT, et al. Regional anesthesia in the patient receiving antithrombotic or thrombolytic therapy: American Society of Regional Anesthesia and Pain Medicine Evidence-Based Guidelines (Third Edition). Reg Anesth Pain Med. 2010 Jan-Feb. 35(1):64-101. [Medline]. Garwood CL, Gortney JS, Corbett TL. Is there a role for fondaparinux in perioperative bridging?. Am J Health Syst Pharm. 2011 Jan 1. 68(1):36-42. [Medline]. Narouze S, Benzon HT, Provenzano DA, Buvanendran A, De Andres J, Deer TR, et al. Interventional spine and pain procedures in patients on antiplatelet and anticoagulant medications: guidelines from the American Society of Regional Anesthesia and Pain Medicine, the European Society of Regional Anaesthesia and Pain Therapy, the American Academy of Pain Medicine, the International Neuromodulation Society, the North American Neuromodulation Society, and the World Institute of Pain. Reg Anesth Pain Med. 2015 May-Jun. 40 (3):182-212. [Medline]. Honarmand A, Safavi M, Nemati K, Oghab P. The efficacy of different doses of Midazolam added to Lidocaine for upper extremity Bier block on the sensory and motor block characteristics and postoperative pain. J Res Pharm Pract. 2015 Jul-Sep. 4 (3):160-6. [Medline]. Cummings KC 3rd, Napierkowski DE, Parra-Sanchez I, Kurz A, Dalton JE, Brems JJ. Effect of dexamethasone on the duration of interscalene nerve blocks with ropivacaine or bupivacaine. Br J Anaesth. 2011 Sep. 107(3):446-53. [Medline]. Stan T, Goodman EJ, Bravo-Fernandez C, Holbrook CR. Adding methylprednisolone to local anesthetic increases the duration of axillary block. Reg Anesth Pain Med. 2004 Jul-Aug. 29(4):380-1. [Medline]. Watts SA, Sharma DJ. Long-term neurological complications associated with surgery and peripheral nerve blockade: outcomes after 1065 consecutive blocks. Anaesth Intensive Care. 2007 Feb. 35(1):24-31. [Medline]. Urmey WF, McDonald M. Hemidiaphragmatic paresis during interscalene brachial plexus block: effects on pulmonary function and chest wall mechanics. Anesth Analg. 1992 Mar. 74(3):352-7. [Medline]. Mak PH, Irwin MG, Ooi CG, Chow BF. Incidence of diaphragmatic paralysis following supraclavicular brachial plexus block and its effect on pulmonary function. Anaesthesia. 2001 Apr. 56(4):352-6. [Medline]. Renes SH, van Geffen GJ, Rettig HC, Gielen MJ, Scheffer GJ. Minimum effective volume of local anesthetic for shoulder analgesia by ultrasound-guided block at root C7 with assessment of pulmonary function. Reg Anesth Pain Med. 2010 Nov-Dec. 35(6):529-34. [Medline]. al-Kaisy AA, Chan VW, Perlas A. Respiratory effects of low-dose bupivacaine interscalene block. Br J Anaesth. 1999 Feb. 82(2):217-20. [Medline]. Scammell SJ. Case report: inadvertent epidural anaesthesia as a complication of interscalene brachial plexus block. Anaesth Intensive Care. 1979 Feb. 7(1):56-7. [Medline]. Dutton RP, Eckhardt WF 3rd, Sunder N. Total spinal anesthesia after interscalene blockade of the brachial plexus. Anesthesiology. 1994 Apr. 80(4):939-41. [Medline]. Golf M, Daniels SE, Onel E. A phase 3, randomized, placebo-controlled trial of DepoFoam® bupivacaine (extended-release bupivacaine local analgesic) in bunionectomy. Adv Ther. 2011 Sep. 28(9):776-88. [Medline]. Busfield BT, Romero DM. Pain pump use after shoulder arthroscopy as a cause of glenohumeral chondrolysis. Arthroscopy. 2009 Jun. 25(6):647-52. [Medline]. Rapley JH, Beavis RC, Barber FA. Glenohumeral chondrolysis after shoulder arthroscopy associated with continuous bupivacaine infusion. Arthroscopy. 2009 Dec. 25(12):1367-73. [Medline]. Kinkartz JD, Mansour AA 3rd, Noonan TJ. Post-arthroscopic elbow chondrolysis after continuous intra-articular ropivacaine infusion. J Shoulder Elbow Surg. 2012 Nov. 21(11):e1-5. [Medline]. Noyes FR, Fleckenstein CM, Barber-Westin SD. The development of postoperative knee chondrolysis after intra-articular pain pump infusion of an anesthetic medication: a series of twenty-one cases. J Bone Joint Surg Am. 2012 Aug 15. 94(16):1448-57. [Medline]. Gomoll AH, Kang RW, Williams JM, Bach BR, Cole BJ. Chondrolysis after continuous intra-articular bupivacaine infusion: an experimental model investigating chondrotoxicity in the rabbit shoulder. Arthroscopy. 2006 Aug. 22(8):813-9. [Medline]. Dragoo JL, Korotkova T, Kanwar R, Wood B. The effect of local anesthetics administered via pain pump on chondrocyte viability. Am J Sports Med. 2008 Aug. 36(8):1484-8. [Medline]. Webb ST, Ghosh S. Intra-articular bupivacaine: potentially chondrotoxic?. Br J Anaesth. 2009 Apr. 102(4):439-41. [Medline]. Gupta A, Bodin L, Holmström B, Berggren L. A systematic review of the peripheral analgesic effects of intraarticular morphine. Anesth Analg. 2001 Sep. 93(3):761-70. [Medline]. Tetzlaff JE, Brems J, Dilger J. Intraarticular morphine and bupivacaine reduces postoperative pain after rotator cuff repair. Reg Anesth Pain Med. 2000 Nov-Dec. 25(6):611-4. [Medline]. Kerr DR, Kohan L. Local infiltration analgesia: a technique for the control of acute postoperative pain following knee and hip surgery: a case study of 325 patients. Acta Orthop. 2008 Apr. 79(2):174-83. [Medline]. Kehlet H, Andersen LØ. Local infiltration analgesia in joint replacement: the evidence and recommendations for clinical practice. Acta Anaesthesiol Scand. 2011 Aug. 55(7):778-84. [Medline]. Mahadevan D, Walter RP, Minto G, Gale TC, McAllen CJ, Oldman M. Combined femoral and sciatic nerve block vs combined femoral and periarticular infiltration in total knee arthroplasty: a randomized controlled trial. J Arthroplasty. 2012 Dec. 27(10):1806-11. [Medline]. Borgeat A, Blumenthal S. Postoperative pain management following scoliosis surgery. Curr Opin Anaesthesiol. 2008 Jun. 21(3):313-6. [Medline]. Mariano ER, Afra R, Loland VJ, Sandhu NS, Bellars RH, Bishop ML. Continuous interscalene brachial plexus block via an ultrasound-guided posterior approach: a randomized, triple-masked, placebo-controlled study. Anesth Analg. 2009 May. 108(5):1688-94. [Medline]. Slappendel R, Weber EW, Dirksen R, Gielen MJ, van Limbeek J. Optimization of the dose of intrathecal morphine in total hip surgery: a dose-finding study. Anesth Analg. 1999 Apr. 88(4):822-6. [Medline]. Marino J, Russo J, Kenny M, Herenstein R, Livote E, Chelly JE. Continuous lumbar plexus block for postoperative pain control after total hip arthroplasty. A randomized controlled trial. J Bone Joint Surg Am. 2009 Jan. 91(1):29-37. [Medline]. Paul JE, Arya A, Hurlburt L, Cheng J, Thabane L, Tidy A. Femoral nerve block improves analgesia outcomes after total knee arthroplasty: a meta-analysis of randomized controlled trials. Anesthesiology. 2010 Nov. 113(5):1144-62. [Medline]. Sharma S, Iorio R, Specht LM, Davies-Lepie S, Healy WL. Complications of femoral nerve block for total knee arthroplasty. Clin Orthop Relat Res. 2010 Jan. 468(1):135-40. [Medline]. [Full Text]. Jenstrup MT, Jæger P, Lund J, Fomsgaard JS, Bache S, Mathiesen O. Effects of adductor-canal-blockade on pain and ambulation after total knee arthroplasty: a randomized study. Acta Anaesthesiol Scand. 2012 Mar. 56(3):357-64. [Medline]. Andersen HL, Gyrn J, Møller L, Christensen B, Zaric D. Continuous saphenous nerve block as supplement to single-dose local infiltration analgesia for postoperative pain management after total knee arthroplasty. Reg Anesth Pain Med. 2013 Mar. 38(2):106-11. [Medline]. Wegener JT, van Ooij B, van Dijk CN, Hollmann MW, Preckel B, Stevens MF. Value of single-injection or continuous sciatic nerve block in addition to a continuous femoral nerve block in patients undergoing total knee arthroplasty: a prospective, randomized, controlled trial. Reg Anesth Pain Med. 2011 Sep-Oct. 36(5):481-8. [Medline]. Wegener JT, van Ooij B, van Dijk CN, Karayeva SA, Hollmann MW, Preckel B. Long-term pain and functional disability after total knee arthroplasty with and without single-injection or continuous sciatic nerve block in addition to continuous femoral nerve block: a prospective, 1-year follow-up of a randomized controlled trial. Reg Anesth Pain Med. 2013 Jan-Feb. 38(1):58-63. [Medline]. Sinha SK, Abrams JH, Arumugam S, D'Alessio J, Freitas DG, Barnett JT. Femoral nerve block with selective tibial nerve block provides effective analgesia without foot drop after total knee arthroplasty: a prospective, randomized, observer-blinded study. Anesth Analg. 2012 Jul. 115(1):202-6. [Medline]. Krenzel BA, Cook C, Martin GN, Vail TP, Attarian DE, Bolognesi MP. Posterior capsular injections of ropivacaine during total knee arthroplasty: a randomized, double-blind, placebo-controlled study. J Arthroplasty. 2009 Sep. 24(6 Suppl):138-43. [Medline]. Rooney ME, Lang SA, Klassen L, et al. Intraoperative transcruciate injection: A new approach to postoperative analgesia following total knee arthroplasty. Reg Anesth. 1998. 23:S34. Mulroy MF, Larkin KL, Batra MS, Hodgson PS, Owens BD. Femoral nerve block with 0.25% or 0.5% bupivacaine improves postoperative analgesia following outpatient arthroscopic anterior cruciate ligament repair. Reg Anesth Pain Med. 2001 Jan-Feb. 26(1):24-9. [Medline]. Dauri M, Fabbi E, Mariani P, Faria S, Carpenedo R, Sidiropoulou T. Continuous femoral nerve block provides superior analgesia compared with continuous intra-articular and wound infusion after anterior cruciate ligament reconstruction. Reg Anesth Pain Med. 2009 Mar-Apr. 34(2):95-9. [Medline]. Katz J, Clarke H, Seltzer Z. Review article: Preventive analgesia: quo vadimus?. Anesth Analg. 2011 Nov. 113(5):1242-53. [Medline]. Waldron NH, Jones CA, Gan TJ, Allen TK, Habib AS. Impact of perioperative dexamethasone on postoperative analgesia and side-effects: systematic review and meta-analysis. Br J Anaesth. 2013 Feb. 110(2):191-200. [Medline]. O'Connor JP, Lysz T. Celecoxib, NSAIDs and the skeleton. Drugs Today (Barc). 2008 Sep. 44(9):693-709. [Medline]. Tsukada S, Wakui M, Hoshino A. Pain control after simultaneous bilateral total knee arthroplasty: a randomized controlled trial comparing periarticular injection and epidural analgesia. J Bone Joint Surg Am. 2015 Mar 4. 97 (5):367-73. [Medline]. Kratz T, Dette F, Schmitt J, Wiesmann T, Wulf H, Zoremba M. Impact of regional femoral nerve block during general anesthesia for hip arthoplasty on blood pressure, heart rate and pain control: A randomized controlled study. Technol Health Care. 2015 Jun 10. 23 (3):313-22. [Medline].